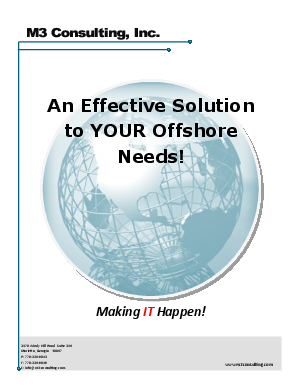 White Paper Published By: M3 Consulting, Inc.
Offshoring is becoming increasingly popular today. It is cost effective and appealing to businesses of all sizes. However, what methods do you use in determining which offshore vendor to use, or if using an offshore vendor is really an effective solution to your problems? M3 consulting not only offers offshore and onsite services, but we also provide audit services to companies seeking to offshore areas of their business. Even if M3 is not the company which best serves your needs, we have the resources and ability to audit incoming proposals in order to help you further asses your needs and the vendor's offered benefits. At times, projects that are offshored can go over time and budget constraints, we help ensure that these problems do not arise through utilization of our resources in India. If M3's software services cannot offer your company the optimal solutions to your problems, we will find someone who will.